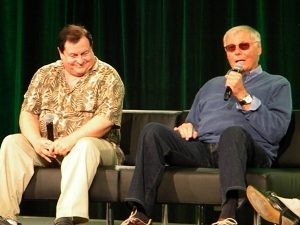 "Fans of the original ‘60s Batman TV series gathered in the main hall at the Washington State Convention Center to cheer two of their heroes, Adam West and Burt Ward—the original Batman and Robin. The pair told mostly well-worn stories, but were warmly welcomed by the hundreds of enthusiastic attendees. West and Ward starred in 120 episodes of the classic series between 1966-68 and also the motion picture adaptation in ’66. Once O’Neill opened the panel up for audience questions, one burning issue was clearly at the forefront of many fans minds: when will the Batman TV series finally make its official DVD and Blu-ray debut? West played extremely coy, stating “a little bird” informed him that a home video release is, in fact, imminent. He also referenced the signing of a deal with Warner Bros. and Mattel that supposedly will lead to a release of the series in the near future. While the news certainly could’ve been much more definitive, it seems like a step in the right direction. West also referenced the upcoming documentary based on his career, Starring Adam West, scheduled to make its world premiere at the Sun Valley Film Festival, March 14-17 in Sun Valley, Idaho. He said that being the subject of a documentary feature “humbled” him."